Home dÃ©cor and furnishing is arguably one of the most unorganized and fragmented consumer products market in the country. Although there are a few large firms at the premium end of the business, even they have struggled to ramp up their network and infrastructure. Now, a growing list of e-tailers are trying to get a bite (and byte) of the business. One such is Mumbai-based start-up Plushplaza.com, which has gained traction recently. Since April, the online portal selling premier home dÃ©cor products, says it has experienced a rush in the number of users signing up on its site to purchase wine holders, candles, vases, figurines, photo frames, beddings and other artefacts. Within a couple of months, the site has witnessed a doubling of registered users and logged over a thousand transactions. "You need not be a big brand, just unique," says Rahul Jagtiani, who set up Plushplaza.com last year and claims that it has just broken even. E-commerce sites like Plushplaza.com, Stylekist.com and Quirko are catering to the artistic, keen-eyed home owners who are generally found exploring antique shops, boutique furniture shops specialising in European designs and international sites such as Etsy.com, for the perfect lamp or vase that will reflect his/her taste and personality, and complete their homes. "Indian entrepreneurs were experimenting with various categories in e-commerce and early traction witnessed by them will be a good indicator of what is taking off. I also think that some players in the lifestyle segment will start addressing this category. However, it is not a crowded space at this point," said Canaan Partners' Alok Mittal. Stylekist.com is run by the Mumbai-based start-up The Idea Factory. The site also offers a range of home dÃ©cor and accessories such as vases, candles, cushions, bowls, trays, wine racks, etc. Unlike Plushplaza.com, Stylekist has adopted an offline-online model and has partnered with boutiques in Mumbai, Bangalore, Hyderabad, Coimbatore and Ahmedabad, as well as in Los Angeles. At Shopo.in, designers are setting up online presence. The Chennai-based Shopo showcases a wide range of products including jewellery, home dÃ©cor, stationery, accessories, etc. Bangalore-based Casamodern.com is another website that caters to designer furnishings. Another website catering to this sector is Bangalore-based Quirko, which retails its own unique designer ware and ships to Bangalore, Delhi, Mumbai, Pune and Cochin. Suvir Sujan, managing director at Nexus India Capital Advisors, said, "There is a need for e-commerce in every category in this country and these sites address the home/dÃ©cor market, which is a large enough market." Home dÃ©cor is not a major category, but its ranking, in terms of wallet spend, is rising fast says Alok Banerjee, who until recently was CEO of home furnishing retail chain Rosebys Ltd. When compared to offline stores, e-commerce shops face the disadvantage of not offering a touch-and-feel option. "There is an element of touch-and-feel involved when it comes to home purchases and they are mostly impulse purchases," shares Banerjee. However, he agrees that when it comes to offering rare items that catches a person's fancy, they will pick it up offline or online. "Anything which is premium is also being picked up," he says. On the other hand, online portals of boutique retail outlets are quite few and do not have a large clientele. Larger retailers may have better success in adopting the online medium as the cost involved is low and they can gain an expanded reach quickly. This can also be a big if for newbies such as Plushplaza. In June, 2010, Jagtiani, a graduate from Virgnia Tech with degrees in Management Information Systems and Marketing, atop a diploma in Interior Design, decided to start a retail business. But he didn't want to start a 'furniture' store. "It must be a premium store. It must have class," he shares the vision. And, this was critical, it must reach that select audience who are patiently searching for just the right home accessory or gift. While he was mulling options, Jagtiani realised that any physical store had its limitations. "Even if I set up an outlet in the most central location in a city, people may not be able to come to the store. It will be inconvenient for many, either because of the traffic or the distance that they may have to cover. The perfect option is to sell online and reach out to everyone, no matter where they live," he says. Although 65 per cent of the website's buyers are from Tier I cities, residents of Haridwar, Aurangabad, Barbil (Orissa), Faridkot and Indore are also purchasing at Plushplaza.com. The site has recently introduced global shipping facility for consumers in the USA, the UK, Denmark, Australia, Sri Lanka and Nepal. There is a transit time of one week for global orders, but buyers are not complaining. Like most start-ups, Plushplaza's team is lean. It outsources its technology needs to a team of four people and employs eight for operations, logistics and customer service. The company began with 70-80 SKUs and has now ramped up to 200 units. But Jagtiani is in no hurry to scale up. "We are targeting upmarket, premium home dÃ©cor segments and we want to restrict our selection to what is rare and attractive," says Jagtiani. And this is what the users appreciate. One Facebook fan says that he finds the products on sale are "unique, cool and crazy." Buyers on Plushplaza.com are busy professionals, aged between 25 and 35, with above-average income and requirements. However, many visitors are still new to e-commerce. Is this a scam? That's one of the frequently asked questions which PlushPlaza.com had to face from consumers during the first month of its launch. Users unaware of online shopping were concerned about credit card information being misused and the team had to convince them of the legality of their business. "Since we are a start-up, we are bound to face such situations," admits Jagtiani. Plushplaza.com currently gets 3,000-4,000 page views per day. Its Facebook page has witnessed a tenfold leap from 100-200 fans in January this year to 1,500, as of June. 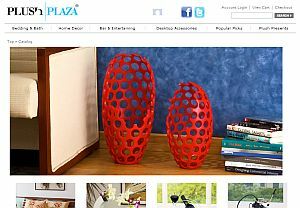 The average transaction size on the site has risen too, from Rs 2,000 to Rs 7,000, with international buyers purchasing from Plushplaza.com. And the profit margin varies between 50 per cent and 70 per cent per sale. Gifting is rising as a hot category for Plushplaza.com. Around 40 per cent of all purchases made on the site are gifts for weddings, anniversaries and house-warming ceremonies. Plushplaza has now extended its services to corporate houses and has clients in banking, pharmaceutical, telecommunications and medical industries. The site is also partnering with daily deal sites, gifting sites and online fashion stores such as 99Labels.com, to showcase its products. With Indian and global brands showing interest in e-commerce sites specific to lifestyle and home improvements, there are opportunities galore for ventures like Quirko, Stylekist and Plushplaza.